In the immortal words of Harry Nilsson, "everybody's talkin'" about Midnight Cowboy, the first X-rated movie to win an Academy Award. In fact, the film won three Oscars -- Best Picture, Best Director (John Schlesinger), and best adapted script (Waldo Salt). Jon Voight and Dustin Hoffman were nominated, but lost out to John Wayne. The film's rating was later revised to R, but it remains a potent portrait of America in the late 60s admidst a collision of naive optimism and hopeless cynicism. (My first impression of the film was, admittedly, permanently imprinted on my brain from a Mad Magazine parody.) And now it's coming to the Criterion Collection. A small-town fable about violence and redemption, Moonrise is the final triumph of Frank Borzage, one of Hollywood's most neglected masters. Stigmatized from infancy by the fate of his criminal father, young Danny (Dane Clark) is bruised and bullied until one night, in a fit of rage, he kills his most persistent tormenter. As the police close in around him, Danny makes a desperate bid for the love of the dead man's fiancée (Gail Russell), a schoolteacher who sees the wounded soul behind his aggression. With this postwar comeback, Borzage recaptured the inspiration that had animated his long and audacious early career, marrying the lyrical force of his romantic sensibility with the psychological anguish of film noir in a stunning vindication of faith in the power of love. This wry, melancholic comedy from Aki Kaurismäki, a response to the ongoing global refugee crisis, follows two people searching for a place to call home. Khaled (Sherwan Haji), a displaced Syrian, lands in Helsinki as a stowaway; meanwhile, middle-aged Finnish salesman Wikström (Sakari Kuosmanen) leaves his wife and his job and buys a conspicuously unprofitable seafood restaurant. Khaled is denied asylum but decides not to return to Aleppo-and the paths of the two men cross fortuitously. As deadpan as the best of the director's work, and with a deep well of empathy for its down-but-not-out characters (many of them played by members of Kaurismäki's loyal stock company), The Other Side of Hope is a bittersweet tale of human kindness in the face of official indifference. Paul Schrader's visually stunning, collagelike portrait of the acclaimed Japanese author and playwright Yukio Mishima (played by Ken Ogata) investigates the inner turmoil and contradictions of a man who attempted the impossible task of finding harmony among self, art, and society. Taking place on Mishima's last day, when he famously committed public seppuku, the film is punctuated by extended flashbacks to the writer's life as well as by gloriously stylized evocations of his fictional works. With its rich cinematography by John Bailey, exquisite sets and costumes by Eiko Ishioka, and unforgettable, highly influential score by Philip Glass, Mishima: A Life in Four Chapters is a tribute to its subject and a bold, investigative work of art in its own right. With this arresting drama based on notorious real-life events, Cristian Mungiu mounts a complex inquiry into faith, fanaticism, and indifference. At a desolate Romanian monastery, a young novice nun, Voichita (Cosmina Stratan), reunites with her former companion Alina (Cristina Flutur), who plans to take her to Germany. But Voichita proves unwilling to abandon her calling, and Alina becomes increasingly desperate to reclaim her devotion, putting the outsider at odds with the monastery's ascetic priest-and precipitating a painfully misguided, brutal attempt to save her soul. A naturalistic tragedy with the dark force of a folktale, anchored by the fraught dynamic between cinema newcomers Flutur and Stratan (who shared the best actress prize at Cannes), Beyond the Hills bears powerful witness to individuals at cross-purposes and institutions ill-equipped to help those most in need. Blending rigorous naturalism with the precise construction of a thriller, this Cannes award-winning drama from Cristian Mungiu sheds light on the high stakes and ethical complexities of life in contemporary Romania. As his daughter nears high-school graduation, Romeo (Adrian Titieni), an upstanding doctor, counts on her winning a competitive scholarship that will send her to university in England. But when an injury sustained during a sexual assault compromises her performance on an important exam, Romeo's best-laid plans for her threaten to crumble, leading him to seek favors in a world that runs on backscratching and bribery. Suffused with quiet dread, Graduation takes a humane and deeply ambiguous look at how corrosive rampant corruption is to moral convictions. A profound masterpiece from one of the most revered filmmakers in the history of cinema, director Robert Bresson's Au hasard Balthazar follows the donkey Balthazar as he is passed from owner to owner, some kind and some cruel but all with motivations outside of his understanding. Balthazar, whose life parallels that of his first keeper, Marie, is truly a beast of burden, suffering the sins of humankind. But despite his powerlessness, he accepts his fate nobly. Through Bresson's unconventional approach to composition, sound, and narrative, this simple story becomes a moving parable about purity and transcendence. 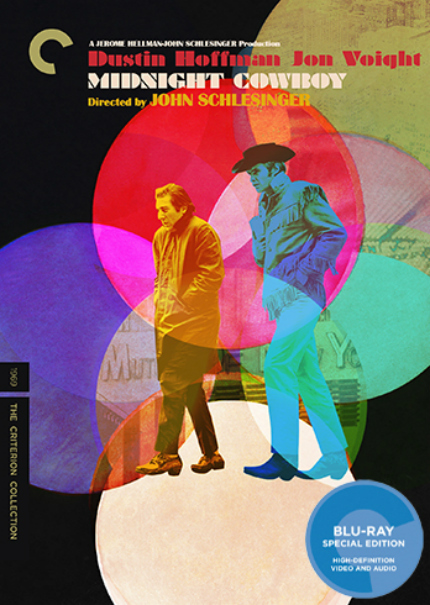 One of the British New Wave's most versatile directors, John Schlesinger came to New York in the late-1960s to make Midnight Cowboy, a picaresque story of friendship that captured a city in crisis and sparked a new era of Hollywood movies. Jon Voight delivers a career-making performance as Joe Buck, a wide-eyed hustler from Texas hoping to score big with wealthy city women; he finds a companion in Enrico "Ratso" Rizzo, an ailing swindler with a bum leg and a quixotic fantasy of escaping to Florida, played by Dustin Hoffman in a radical departure from his breakthrough in The Graduate. A critical and commercial success despite controversy over what the MPAA termed its "homosexual frame of reference," Midnight Cowboy became the first X-rated film to receive the best picture Oscar, and decades on, its influence still reverberates through cinema.